Berlin (AINA) — By an overwhelming majority, the German parliament (Bundestag) passed a symbolic and long overdue resolution on Thursday, June 2, 2016, recognizing the 1915 massacre of Armenians by the Ottoman government as a genocide. In its main part, the resolution also explicitly acknowledges that Assyrians (also referred to as Syriacs, Chaldeans or Aramaic-speaking Christians) were affected by the deportations and massacres as well. The importance of this is that the German Empire was the principal military ally of the Ottoman Empire during World War I and was, through its diplomatic network, well aware of the events taking place in Anatolia. With this week’s decision, Germany joins more than 20 countries worldwide which have already officially declared the horrific events of 1915 a genocide, including France, Canada, and Russia. The issue is bound to create tensions between Germany and Turkey, especially since Germany and the EU are dependent upon Turkey in the current migrant and refugee crisis. Turkey withdrew its ambassador to Germany “for consultations” barely two hours after the decision. But despite protests from Turkish leaders and Turkish associations in Germany, German lawmakers voted nearly unanimously for the resolution. Only one member of parliament, a member of German Chancellor Angela Merkel’s Christian Democratic Party, voted against it, while one other MP abstained. This is not the first time German parliamentarians have tried to take a vote on this sensitive issue. Originally, the vote had been scheduled to take place on the 100th anniversary of the genocide in 2015. But since German Chancellor Merkel and her allies in parliament feared a negative impact on German-Turkish relations, the issue was postponed repeatedly. Still, it gained important political impetus last year, when two of the highest German politicians addressed the events of 1915 and referred to them as genocide. In a speech dedicated to the commemoration of the century-old events on April 23, 2015, Federal President Joachim Gauck emphasized that “the fate of the Armenians exemplifies the history of mass exterminations, ethnic cleansing, expulsions, and yes, genocide, which marked the 20th century in such a horrific way. But he also explicitly referred to the Assyrians and Pontic Greeks, stressing that they, too, fell victim to mass expulsions and systematic mass killings aimed at creating an ethnically and religiously homogenous Turkish state.The following day, on April 24, 2015, the German Bundestag held a debate on this topic without passing a resolution. On this occasion, Dr. Norbert Lammert, President of the German parliament, explained that the killings of 1915 clearly amounted to genocide and that the German Empire, a principal ally of the Ottoman Empire, was aware of the crimes committed by its partner in arms, but chose to place its military alliance above the rescue of human lives. During the debate, speakers from all parliamentary parties joined Lammert in declaring the killings a genocide and almost all of these speakers explicitly named the Assyrian Christians as victims of this genocide. A resolution was then supposed to be passed last October, but it was delayed. In a short debate in the German Bundestag in February 2016, the chairman of the opposition Green Party, Cem Oezdemir, urged for a joint resolution on the issue. Finally, this week, Merkel’s conservative bloc, the center-left Social Democrats and the Green Party were able to put up a resolution (see translation below) for vote in the German Bundestag, which uses the term genocide in the headline and several times in the text. The German Bundestag pays tribute to the victims of expulsion and massacres, which were committed against the Armenians and other Christian minorities of the Ottoman Empire and which began over a century ago. It deplores the actions of the former Young Turk government, which led to an almost complete annihilation of the Armenians in the Ottoman Empire. Members of other Christian ethnic groups, especially Aramean/Assyrian and Chaldean Christians, were affected by deportations and massacres as well. By order of the Young Turk regime, the planned expulsion and extermination of over a million ethnic Armenians began in the Ottoman city of Constantinople on April 24, 1915. Their fate exemplifies the history of mass extermination, ethnic cleansing, expulsions, and yes, of genocides, which marked the 20th century in such a horrific way. The Bundestag regrets the inglorious role of the German Empire, which, as a principal ally of the Ottoman Empire, did not try to stop these crimes against humanity, despite explicit information regarding the organized expulsion and extermination of Armenians, including also from German diplomats and missionaries. When we look into the region, we see that Christians are being persecuted again — in Iraq, in Syria and also in Turkey. The places those Armenians arrived at who survived the deportation marches are located in the middle of war zones, for example Aleppo and Deir al-Sor. After we in this parliament have been commending the restructuring of churches in Turkey for many years, churches are now being nationalized and closed again. Priests can de facto not be trained as clergymen anymore. (…) As a person with Sunni-Muslim origins, I am gravely concerned about the East-Christendom. Christian communities are threatened with extinction in the cradle of Christianity of all places. I want to say to our Turkish friends: This is not about pointing fingers or claiming moral authority. We are not introducing this motion, because we feel morally superior or because we want to intervene in foreign affairs, but because this constitutes a part of our German history. Just how sensitive the issue of the Armenian and Assyrian genocide is in German-Turkish relations is highlighted by the absence of German Chancellor Merkel and two of the most senior Social Democratic ministers during the debate. Chancellor Merkel, Vice-Chancellor Sigmar Gabriel, and Foreign Minister Frank-Walter Steinmeier did not attend the vote, stating prior government business in Germany or abroad as reason. But in fact, the resolution comes at a delicate time for Angela Merkel, who is relying on Turkey in order to handle current political challenges. Turkey is not only a crucial NATO partner, but also especially important to Germany and its European partners in order to slow down the flow of migrants to Western Europe. A new EU-Turkey deal aimed at stopping the illegal flow of refugees from Turkey to the European Union was championed by Angela Merkel earlier this year. In the run-up to the debate, Turkish President Recep Tayyip Erdogan had warned Angela Merkel that the resolution would damage “bilateral, diplomatic, economic, trade, political and military” relations with Turkey. Turkey has always rejected the use of the term genocide to describe the events of 1915/1916, denying there was a systematic attempt to destroy the Christian population and further denying that there were any such orders from the Ottoman authorities. President Erdogan did not exclude the possibility of sanctions against the Federal Republic of Germany. It is a historic mistake for the German Parliament to accept some ‘distorted and unfounded’ allegations as ‘genocide’. German Parliament accepting this resolution is unbecoming of the friendship between Turkey and Germany. This issue is one that needs to be resolved by people of science and historians, not one to be solved by politicians of parliaments. The way to close the dark pages in your own history is not by besmirching the history of other countries with irresponsible and groundless parliamentary decisions. This decision which is against history and the future will no doubt have an impact on German-Turkish relations and will damage bridges of friendship between the two countries. However, both President Erdogan and Prime Minister Binali Yildirim said that Turkey would not terminate the EU-Turkey deal over this issue. Also, Turkey has withdrawn its ambassadors from other countries whose parliaments or governments have recognized the genocide in the past, but has quietly returned them to their posts a few months later. The German Bundestag pays tribute to the victims of expulsion and massacres, which were committed against the Armenians and other Christian minorities of the Ottoman Empire and which began over a century ago. It deplores the actions of the former Young Turk government, which led to an almost complete annihilation of the Armenians in the Ottoman Empire. Members of other Christian ethnic groups, especially Aramean/Assyrian and Chaldean Christians, were affected by deportations and massacres as well. By order of the Young Turk regime, the planned expulsion and extermination of over a million ethnic Armenians began in the Ottoman city of Constantinople on April 24, 1915. Their fate exemplifies the history of mass extermination, ethnic cleansing, expulsions, and yes, of genocides, which marked the 20th century in such a horrific way. We are aware of the uniqueness of the Holocaust, for which Germany bears guilt and responsibility. The Bundestag regrets the inglorious role of the German Empire, which, as a principal ally of the Ottoman Empire, did not try to stop these crimes against humanity, despite explicit information regarding the organized expulsion and extermination of Armenians, including also from German diplomats and missionaries. The commemoration of the German Bundestag is also an expression of particular respect for the probably oldest Christian nation on earth. The German Bundestag reaffirms its decision of 2005 (Printed matter 15/5689), which was dedicated to the commemoration of the victims as well as to the historical reappraisal of the events and which aimed at contributing to the reconciliation between Turks and Armenians. 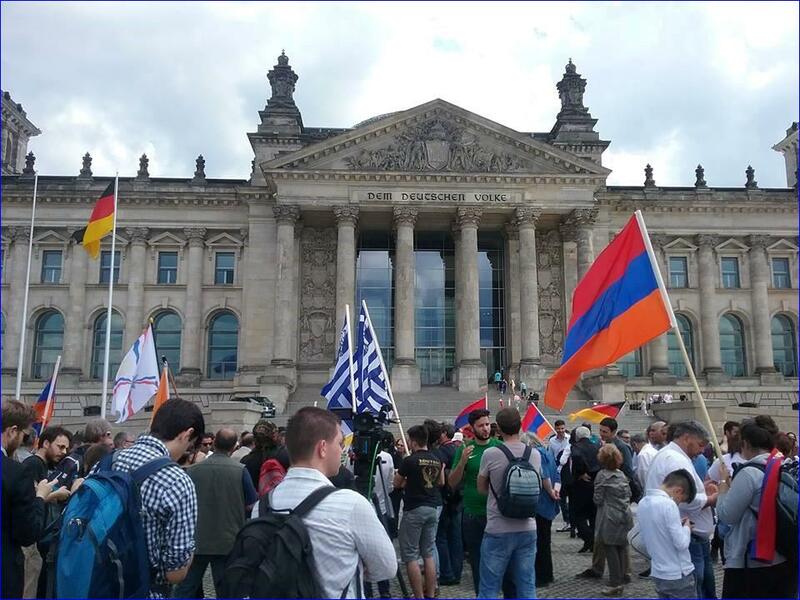 During the debate on the centenary commemoration day on April 24, 2015, in the German Bundestag, speakers of all parliamentary groups and in particular the Federal President, on the eve of the debate, condemned the genocide committed against the Armenians, commemorated the victims and called for reconciliation. The German Empire bears partial complicity in the events. The Bundestag commits to the special historical responsibility of Germany. This includes supporting Turks and Armenians in overcoming old divisions and seeking paths of reconciliation and understanding. This reconciliation process has come to a halt in the past few years and urgently needs new impulses. With its commemoration of the unimaginably cruel crimes, the German Bundestag honors not only their victims, but also all of those in the Ottoman Empire and the German Empire, who, over 100 years ago, under difficult circumstances and against the resistance of their respective government, devoted themselves to the rescue of Armenian women, children and men. In order to deal with the history of ethnic conflicts in the 20th century, school, university, and political education in Germany need to re-analyze the expulsion and extermination of Armenians by including the issue in curricula and teaching materials and by passing it on to future generations. The federal states play a particularly important role in this process. The German Bundestag also considers the commemoration of the Armenian victims of the massacres and displacement, while taking into account the German role and its presentation to fellow citizens of Turkish and Armenian origin, a contribution to integration and peaceful coexistence. The German Bundestag also welcomes the increasing number of initiatives and contributions in the field of science, civic society, art and culture in Turkey, which aim at the reappraisal of the crimes against the Armenians and the reconciliation between Armenians and Turks. The German Bundestag encourages the Federal Government to continue to pay attention to the commemoration and reappraisal of the expulsions and massacres of the Armenians of 1915. Furthermore, the German Bundestag welcomes any initiative aimed at boosting and supporting this concern. Germany’s own historical experience shows how difficult it is for a society to face the dark chapters of its own past. However, a honest appraisal of history is the most important basis for reconciliation within a society as well as with others. A distinction has to be made between the guilt of the perpetrators and the responsibility of those alive today. The remembrance of the past also reminds us to stay alert and to prevent that hatred and destruction threaten people and nations over and over again. The German Bundestag recognizes the attempts undertaken since 2005 by the representatives of Armenia and Turkey to come together on issues of memory and the normalization of inter-state relations. Still, the relationship between the two states is contentious and marked by mutual distrust. Germany should help Turks and Armenians to come closer to one another. A constructive analysis of history is essential for a common understanding in the present and in the future. The easing of tensions and the normalization of relations between the Republic of Turkey and the Republic of Armenia are also important for the stabilization of the Caucasus region. In context of the EU neighborhood policy and due to its historical role in the German-Armenian-Turkish relationships, Germany sees itself in a particular responsibility in this regard. to continue to support, within budgetary possibilities, German initiatives and projects in science, civil society and culture which deal with the analysis of the events of 1915/1916. The annihilation of the Armenians in the Ottoman Empire during World War I was the largest and most serious calamity in the several thousand-year old history of the Armenian people. According to independent estimations, over a million Armenians fell victim to deportations and mass killings. Numerous independent historians, parliaments and international organizations consider the expulsion and extermination of Armenians a genocide. The commemoration of these expulsions and massacres in addition to religion and language is therefore a central part of the identity of these people. The German Bundestag also commemorates the events in the context of the current remembrance of World War I. The German Empire was a principal military ally of the Ottoman Empire. The former government of the German Empire was informed about the persecution and murder of the Armenians, but remained inactive. The Federal Republic of Germany considers it a responsibility to promote the reappraisal of this crime and to keep its memory alive. Contrary to the facts, Turkey denies to this day that the expulsion, persecution and murder of Armenians was based on systematic planning or that the mass extermination during the resettlement measures and the massacres committed were intended by the Ottoman government. protocol in 2009, which, among others, stipulated the establishment of a commission that should investigate the history in a scholarly manner. But until today, neither of the two parliaments has adopted this protocol. A reconciliation between the two nations is only imaginable if the events that occurred 100 years ago are fundamentally clarified and the facts are not denied any longer. This requires that scholars and journalists in Turkey, who deal with the history of the expulsion and murder of Armenians, can work freely and without fear of reprisals. There are already numerous initiatives in Turkey which deal with the historic revision of the massacres. For some years, the issue has been discussed in the Turkish public in an increasingly controversial manner. These developments are to be welcomed as well as cross-border civil society projects that have been financially supported by the [German] Foreign Office for many years. The German Empire, as principal military ally of the Ottoman Empire, was also involved in these operations. From the start, both the political and the military leadership of the German Empire was informed about the persecution and killing of Armenians. When the Protestant theologian Dr. Johannes Lepsius presented the results of the research he had carried out in Constantinople during July/August 1915 to the German Reichstag on October 5, 1915, the entire topic was placed under censorship by the German Imperial Government. His “Report on the Situation of the Armenian People in Turkey”, which he had directly sent to the members of the Reichstag in 1916, was also banned and confiscated by the German military censorship and handed over to the members of the parliament only after the end of World War I in 1919. Despite urgent petitions by many German personalities from science, politics and the churches, including by politicians such as Philipp Scheidemann, Karl Liebknecht or Matthias Erzberger, and prominent public figures from the Protestant and Catholic Church, such as Adolf von Harnack and Lorenz Werthmann, the German Imperial Government refrained from putting effective pressure on their Ottoman ally. The files of the [German] Foreign Office, which are based on reports of German ambassadors and consuls in the Ottoman Empire, also document the planned implementation of the massacres and expulsions. They constitute the most important government record of the events of that time. The [German] Foreign Office already made these files available many years ago. In 1998, a complete set of the files on Microfiche was delivered to Armenia. Turkey subsequently also acquired a set. Translated from German by Abdulmesih BarAbraham and Miryam A. Abraham. Miryam A. Abraham has a bachelor degree from the University of Passau in Governance and Public Policy and is now a master student in International Relations at the Technical University of Dresden. She attended the German Bundestag debate on June 2, 2016, in Berlin. © 2016 Assyrian International News Agency. This entry was posted in Featured News, News and tagged German Empire, Germany, Ottoman Empire, Related Assyrian Genocide, Turkey Deputy Prime Minister Numan Kurtulmus by Orthodoxy Cognate PAGE. Bookmark the permalink.